Endodontics, commonly known as Root Canal Treatment has been very successful for saving severely damaged teeth. Gone are the days that you get a tooth pulled every time you have a toothache or a broken tooth. When the pulp (the soft tissue inside the tooth that contains nerves , blood vessels and lymph tissues) is diseased or injured and unable to repair itself, the pulp dies. The most common cause of pulp death is a fractured tooth, trauma, or a deep cavity, which can expose the pulp to bacteria found in the saliva. The bacteria causes the infection inside the tooth. If the damaged or diseased pulp is not removed, the tooth and surrounding tissues become infected. Eventually the tooth would have to be removed. Sometimes the initial symptom that the tooth may experience is discoloration or a change in color. If Dr. Martinez can treat the tooth with endodontic treatment early enough, then there is a higher possibility in saving the tooth that would have previously been extracted. When the pulp of a tooth becomes infected (often from a deep cavity, trauma or from a fracture), the infection can spread throughout the pulp. If the root canal treatment is not done, the infection may travel into the tissues surrounding the root tip. This can cause the adjacent bone to erode. The pocket that forms is the abscess. If the abscess increases in size, it becomes very painful!. Severe swelling may occur that can be very dangerous to the patient's health. The endodontic procedure or root canal is actually a micro surgery procedure within the tooth. When the pulp tissue of the tooth is damaged and is dying or dead, it is cleaned out within the narrow roots. Then each canal or root must be filled with a specialized filling to seal it off. Now the body must repair the damage or erosion that infection caused. After the endodontic or root canal treatment is completed the tooth must be built up possibly using posts or pins within the tooth and a hard bonding type of building material and perhaps needing a crown since the tooth may become brittle or weaker. 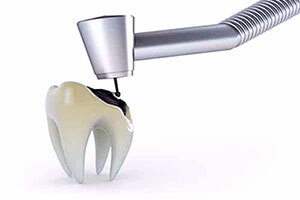 With our new technology a tooth that once needing extraction can be saved for many years.